Increase your Score with EXPLORE Test Strategy! 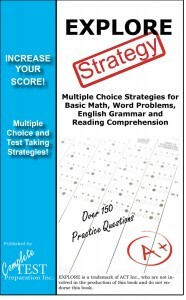 Learn and Practice Proven multiple choice strategies for Reading Comprehension, basic math and English! If you are preparing for the EXPLORE College Readiness exam, you probably want all the help you can get! EXPLORE Test Strategy is your complete guide to answering multiple choice questions! Includes over 150 vocabulary practice questions. Like any test, your degree of success on the EXPLORE depends largely on knowing how to study for it. Now, I’m not talking about burning the candle at both ends. In fact, our goal is to have you studying less not more. Nor are we asking you to spend hundreds of dollars on study guides. Our material is available for a less than the cost of a good pair of running shoes … more on that in a moment. What many successful EXPLORE takers understand, is the more questions you see, the more likely you are to pass the test. You can fine-tune your knowledge in areas where you feel comfortable and be more efficient in improving your problem areas. Our test has been developed by our dedicated team of experts. All the material in the study guide, including every practice question, is designed to engage the critical thinking skills that are needed to pass the EXPLORE Exam. They will not be the exact same questions you’ll find on the exam, but they are similar. Yes, I Want To Do Everything I Can To Pass My EXPLORE On The First Try! How Do I Get Started? Simply click on the link provided to take your first step! Winning multiple choice strategies for the Post Secondary Readiness Test. Learn and practice multiple choice strategies for reading comprehension, basic math and English grammar. 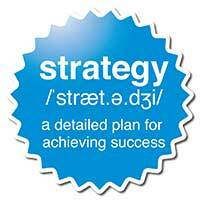 Over 150 strategy practice questions with extensive commentary. Also includes how to take a test, and how to prepare for a test! Order Download Version - $9.99 PDF Version of Printed Version. Download after purchase. No shipping! No Waiting!